Well, I just recently got back from my first Phish shows in almost five years, and, well, Oh My God! FYI, this picture is ridiculous! From left to right: Dan Woolard, Erik Mitchell, Brian Moore, Craig Mummert, Frank Maier, Keith Collins, and Mike Kavanagh. I had the ultimate pleasure of enjoying a Sunday afternoon with these guys prior to a Phish show in Camden on Sunday. I have know these guys for going on 20 years (! ), I met them all between 1989 and 1994 – crazy, crazy, crazy!! Anyway, back to Phish, last time I talked about this guys I was more than disappointed with the way things ended, and I was very sceptical for the way things were going to re-star, again. 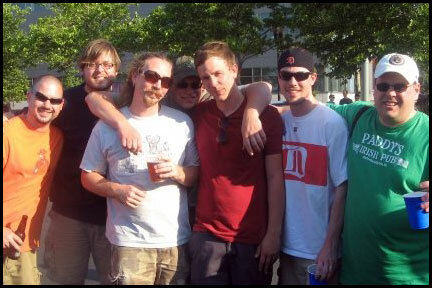 I was very broken-hearted back in 2004 and I was scared to let Phish back in, it was very much like an old girlfriend. But, they did good, they did real good! I was lucky enough to go to three show this summer tour, Thursday 6/4 at Jones Beach, NY, Friday 6/5 at Jones Beach, NY, and Sunday 6/6 at Camden, NJ. If everything the band is putting out there to the public is true, this is a very clean Phish that is rocking like it is the mid-nineties again! I had so much fun at the two Jones Beach shows and Camden was off the charts for me, probably top five favorite shows I’ve been to. Between the people I got to hang with in the lots, to the vibe inside, to the music Phish cranked out it was one amazing time. This entry was posted on Tuesday, June 9th, 2009 at 10:54 pm	and is filed under Side Trip. You can follow any responses to this entry through the RSS 2.0 feed. You can leave a response, or trackback from your own site.